Our popular Slime Workshops are great for beginners and slime experts. Suitable for children aged 4 years and above. Expertly exploring the power of touch, movement, relaxation, communication and interaction between you and your child. 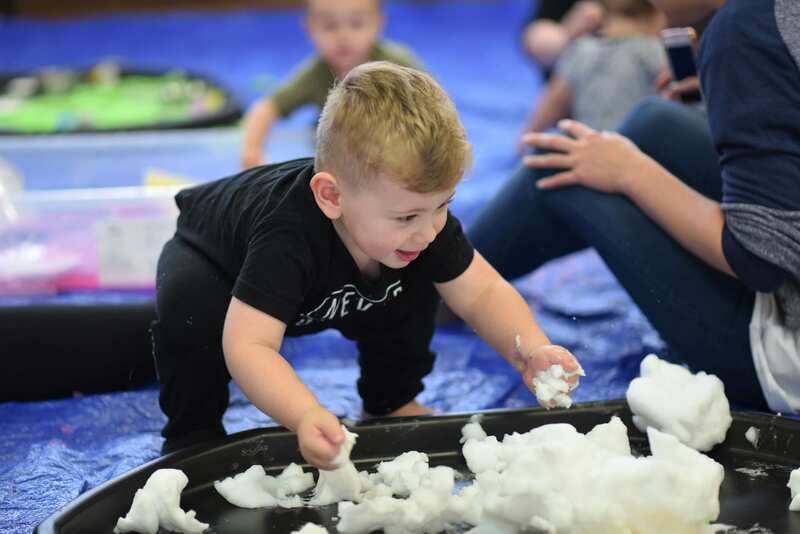 Our popular messy play sessions involve a range of messy activities for your little ones to enjoy. Suitable for children aged 6 months to 4 years. A great social event for everyone enjoy a range of activities in settings from parks, community centres and schools. We offer messy play and slime parties to suit your families needs and make those moments special. Just contact us for more information. My son and I love messy play! Emma always has great areas set up with safe fun activity’s. This messy play is great for sensory learning, texture and general fun! Highly recommend! You can see all our customer feedback on the Testimonials page, Thanks for looking! First Senses Classes is at Carisbrooke Reserve. Our Outdoor Messy Play is back and we have already secured Carisbrooke Reserve as one of our events. We will have all things messy, muddy and all round fun for your little ones. We will be under the rotunda this time to make sure if the weather does turn on us we can still have some messy fun. First Senses Classes shared a post. Why not take a look at our upcoming classes this May/June 2019. We've have some great sessions lined up all over Adelaide with Paw Patrol, Under the Sea and Outdoor Messy Play. We are still waiting to confirm dates for REYNELLA/GAWLER/SEMAPHORE so please do hang in there, dates are coming! Head over to our website to find out more information, availability and to BOOK your place. REMEMBER bookings are essential as sessions are popular and they do book out fast. We recommend booking asap!